Here in the northeast you can find Nabisco Mallomars in the cookie aisle; but they are so much more than a cookie. 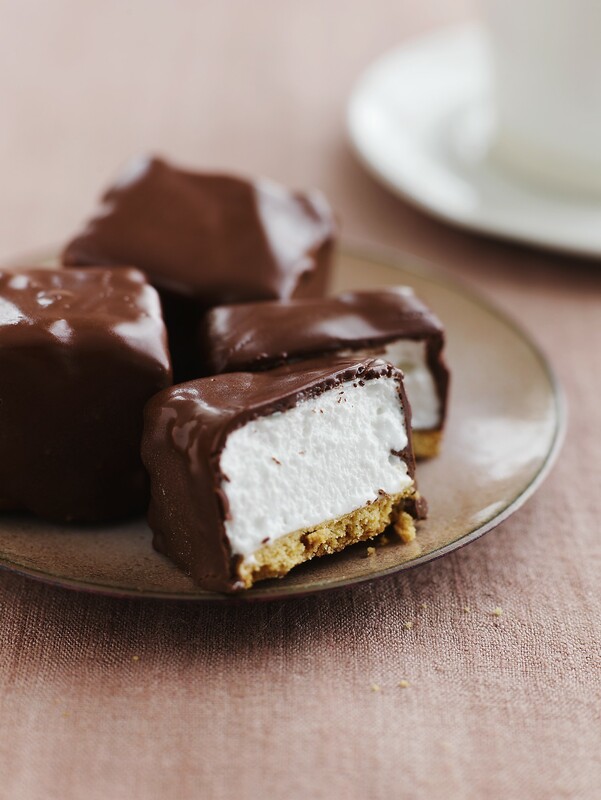 This nostalgic favorite is comprised of a circular graham cracker-like cookie topped with a thick marshmallow filling and covered with a crisp, dark chocolate shell. They are sort of a commercial s’more and have been produced since 1913. They have fierce devotees and similar confections can be found worldwide, sometimes with more of a shortbread base, sometimes a differing in shape from the domed, squat American classic. In Canada they are called Whippets, Krembos in Israel, Flodebolle in Denmark, Tunnock’s teacake in the United Kingdom, Zefir in Russian speaking countries, Schokokuss in Germany and Mallowpuffs in New Zealand. Now you can make them in your own kitchen. The graham cookie can be made a day or two ahead, as can the marshmallow, so take advantage of these do-ahead steps to make the whole recipe easier. I went with a square shape to eliminate waste – and as an homage to our campfire s’more. For the Marshmallows: Coat a 13 x 9-inch pan with non-stick spray, line bottom with parchment cut to fit, then spray parchment. Pour ½ cup water in a small bowl. Sprinkle gelatin over and set aside for 5 minutes to soften gelatin. Place sugar, corn syrup, 1/3 cup water and salt in medium sized saucepan and stir to combine. Attach candy thermometer and cook over medium heat until it reaches 240 degrees F. Remove from heat and whisk in softened gelatin until dissolved. Cover pot and leave on stove with burner turned off, to keep warm. Place egg whites in clean, grease-free mixer bowl and whip until frothy on low speed using the wire whip attachment. Add the cream of tartar and turn speed to medium-high and whip until soft peaks form. Pour a thin, steady stream of the sugar syrup directly over meringue with mixer running. Do not pour any on the whip or the sides of the bowl. Whip meringue until cool to the touch; this could take 5 minutes or more. The marshmallow should be thick, glossy and form medium-firm peaks. Immediately spread marshmallow in prepared pan with an offset spatula, pressing down into corners and smoothing top. Lightly dust the top with a thin veneer of cornstarch. Let sit at room temperature for 6 hours or overnight. Sprinkle a piece of parchment with cornstarch, run an icing spatula around edges of marshmallow and invert on top of parchment. Peel parchment off of marshmallow if it comes loose from pan. Use a long, sharp, thin-bladed knife to cut into about 40 1 ½-inch squares (8 x 5). Marshmallows may be used immediately, or they may be stored, in which case, toss with some cornstarch to prevent them sticking to one another. Store at room temperature in an airtight container for up to 3 days before assembling cookies. For the Grahams: Line two jellyroll pans with parchment paper; set aside. Whisk together flour, baking soda and salt in a small bowl to aerate and combine; set aside. Beat butter until creamy with flat paddle on medium-high speed, about 2 minutes. Add sugar and honey and continue to beat, about 3 minutes at medium-high speed, until creamy. Beat in the vanilla. Add the flour mixture in two additions, alternately with the milk. Begin and end with the flour mixture and beat until combined. Lightly flour your work surface. Roll dough out to ¼-inch thickness and cut out cookies into 1 ½-inch squares. Transfer cookies to prepared pans, spacing 1-inch apart. Gently gather together extra dough and cut out as many cookies as possible. Refrigerate while oven preheats. Position racks in upper and lower third of oven. Preheat oven to 350 degrees F. While oven preheats, make sure marshmallows are ready to use. If they have been coated with cornstarch, shake them gently to remove any excess. Bake for about 12 to 14 minutes or until cookies are dry to the touch, but still have a tiny bit of spring to them. Do not bake until crisp. Their color will barely change. Place pans on racks and immediately, while cookies are still warm, place a marshmallow on top of each cookie. The heat of the cookie will seal the marshmallow to the cookie, which is very important for the chocolate dipping step. Cool completely. For the Assembly: Melt chocolate in top of double boiler or in microwave. Place in a narrow, deep bowl. Pick up one cookie at a time and plunge it, marshmallow side down, into the chocolate. The chocolate should cover the marshmallow completely as well as the sides of the cookie. Lift out of the chocolate and shake gently back and forth to encourage excess chocolate to drip off. Place cookie-side down on pan and repeat with remaining cookies. Refrigerate briefly to set chocolate. Store at room temperature for up to 3 days in airtight container in single layers separated by parchment paper. Alternatively, they may be refrigerated for up to 1 week. Bring to room temperature before serving. Tip: The physical beauty of these cookies will depend on how cleanly and neatly you cut the cookies and the marshmallows, so take care during those steps. Also, dipping the cookies can be tricky. If you do not place the marshmallows on the cookies immediately after they come out of the oven, the heat from the cookies will have dissipated and not be enough to semi-melt the bottoms of the marshmallows. There won’t be enough heat to affix them to the cookie. You will know whether this step worked or not when you try to dip the cookies because the marshmallows will fall off. An alternate method for dipping would be to place the marshmallow topped cookies on a clean cooling rack set over a clean jellyroll pan lined with aluminum foil. The melted chocolate can be poured over the cookies and you can help it stick to the sides with a few swipes of a small offset spatula. Any excess chocolate that drips down onto the pan can be reused.